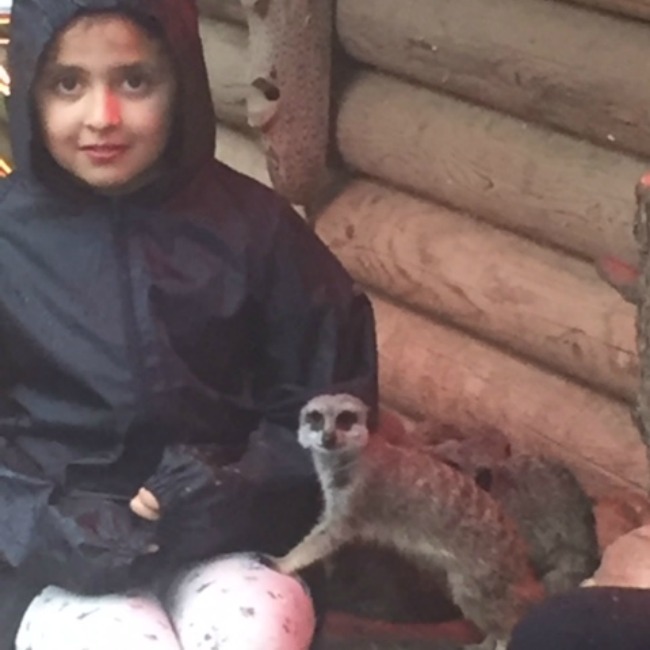 Bill, our CEO at Red Letter Days, recently took his daughter Easha and her friend Holly to meet the meerkats at Paradise Wildlife Park in Hertfordshire. Not many people braved the park on that Saturday, due to torrential rain (it hammered down. All day). But Easha and Holly were NOT going to let that spoil their fun! Saturday 7 November was Meerkat Day for Eeasha. She had been waiting ages to enjoy this 10th birthday present, and a few (or even several) inches of rain was not going to put her off – whatever her dad said. 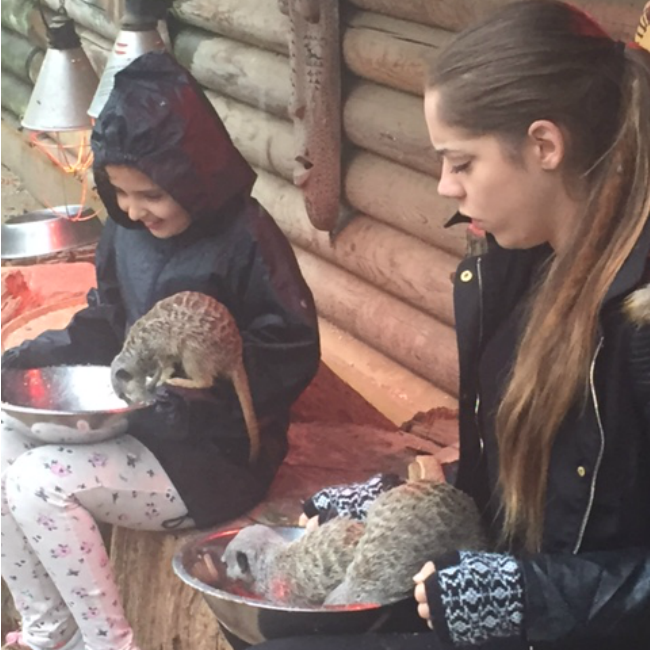 Luckily for Easha and Holly, although their experience in the meerkat enclosure with the keeper was outside, they were all nicely under cover. It was the accompanying adults who had to stand in full force of the rain. But proud dad with the video camera tells us it was all worth it, to see the girls’ faces as they fed and interacted with the many meerkats. The girls learned some information about their furry friends from the friendly keeper to start. Twig is the name of the dominant female (she took a shine to Holly and rolled over on her lap, for her belly to be stroked). A while ago Twig had begun to display ‘typical behaviour’ to maintain her top place in the hierarchy. Such behaviour had included aggressively pushing out youngsters who could potentially threaten her place as number one. So the park now have two separate meerkat groups. Peace is restored, with clans living happily in their two different hierarchies and Twig back to her loveable old self. Meerkats are highly social animals and like to live in groups (of between 20 – 50). Hierarchy is very important for this group of mammals and is very evident at feeding time. For instance, no other meerkat would dare to approach either of the two visiting girls before Twig. Only after Twig had taken her food did the next highest couple of meerkats take her place, and so on. Who says it’s only the British who like queueing?